We were waiting for a really weird weekend in college football and, boy did we get it! We always get it. It’s always lying in the weeds waiting to sneak up on us and it never fails. Every year. Here are my thoughts on the week that was. When the Bowl Championship Series was around, proponents of the system argued that the regular season functioned as a playoff of sorts, with each loss eliminating a candidate for the National Championship. This kind of went out the window when a 2-loss LSU team won the 2007 title, nevertheless the system survived until 2013. But what I believe Saturday showed is why the current system functions better than the previous one. A loss now is a splash of cold water on the face. A stern warning. If we’re trying to come up with a sports equivalent, it’s almost like a yellow card in soccer. It gives teams the opportunity to right the ship when everything might not be clicking. It gives everyone a mulligan. And the true test now, is how they react to it. While I still believe there are significant merits to an expanded playoff system that wouldn’t tarnish the current regular season, the present setup has been a step in the right direction and it has allowed teams like Ohio State in 2014 and Clemson in 2016 to triumph after early season adversity. We’re not necessarily looking for the eventual champions to run into adversity, but even great teams have a bad day. The history books are littered with the hopes and dreams of champions that never were because of a bad day at the office. I would even argue that teams with one loss are on edge even more than those trying to avoid their first blemish. Teams trying to stay undefeated have no negatives to reflect on. Those with one loss have stared death in the eye already, know what it looks like and are actively trying to escape it. The teams that lost this week now need to fight through it and respond. For as shocking as #2 Clemson’s loss to Syracuse was Friday night, it didn’t shock me that much. There were a number of factors at play that could contribute to an “off night”. 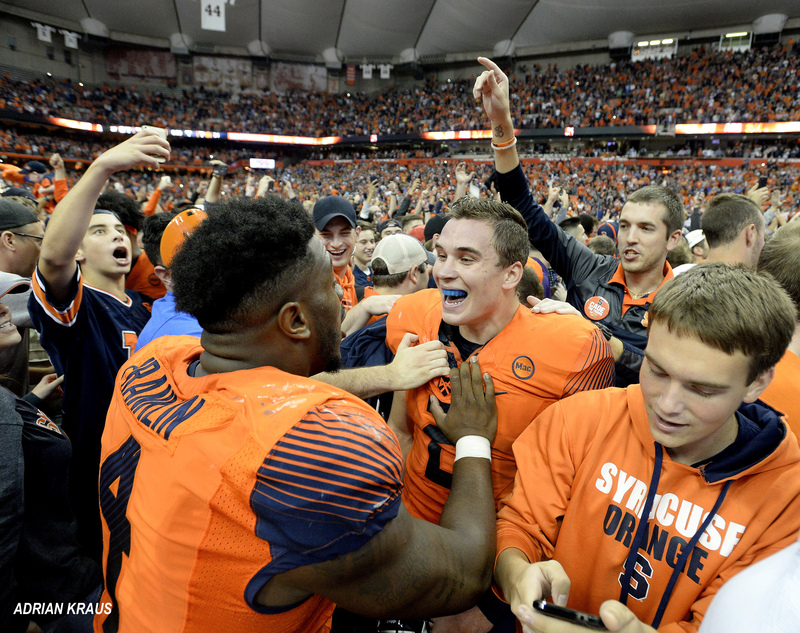 It was on a Friday night (still weird) in the Carrier Dome (stench of weirdness) with Dino Babers (the next hot coach, looking at you UCLA) and quarterback Eric Dungey (more than competent) going up against a banged up Kelly Bryant and Clemson squad after five consecutive weeks of facing potential bowl teams. They lost to Pittsburgh last year and rebounded. If Kelly Bryant can stay healthy I believe Clemson can run the table, and I can’t believe that for the guy there were question marks about at the start of the year that’s what’s needed. Few have a better perspective and read on their team than head coach Dabo Swinney. Washington State’s loss was going to come. For as good as they played, they have yet to have the breakthrough season that put the rest of the nation on notice. They certainly have the firepower to win out, but how will they regroup after head coach Mike Leach called their performance pathetic? The biggest surprise to me was Washington. I knew Washington was going to feel some pain after losing a number of players to the NFL last season, but I never questioned their ability to generate points, especially against a Arizona State team that gave up 36 points per game heading into their matchup. But as I said earlier, even tremendous players like Jake Browning and Austin Pettis have off nights. For as much as skill is involved, there is an inherent randomness to 11 guys in helmets running into 11 other guys in helmets. But like Clemson, Washington lost in the regular season last year, rebounded and made the playoff. There are only six undefeated Power 5 conference teams remaining with six weeks of regular season play left followed by the conference championship games. With 12 one-loss teams technically still alive for the playoff and some of the undefeateds bound to join them, the real battle for survival is yet to come. Two years in a row, my preseason National Champs on b have proceeded to lose Week 1 and plummet throughout the season. Last year, it was LSU. This year, Florida State looks like a shell of what we thought they would be, with Deondre Francois’s injury playing a big part in that. But the one team I went all in on to win the SEC, upset Alabama, and make it to the Final Four, Auburn, had their playoff hopes seemingly dashed in a road loss to a reeling LSU squad thanks to a blown 20 point lead and some questionable time management at the end. It’s all conjuring up images for me of the 2003 Auburn squad. That season, an extremely talented, but extremely young Auburn team, was picked in the Top 5 of a number of preseason publications, with Sporting News even calling for a National Championship. Their preseason No. 6 ranking went by the wayside after their first game, a loss to USC. They preceded to start 0-2, scoring three points combined in those games, and finished the season 8-5 with a bowl victory over Wisconsin. The next year, Auburn came back to go 13-0, bringing back largely the same squad including quarterback Jason Campbell, running backs Carnell Williams and Ronnie Brown and cornerback Carlos Rogers. Now I’m not saying the same thing is going to happen again for Auburn and I’m certainly not going to double down on Auburn for next year (not yet at least), but the similar situations are interesting. At this point, Auburn is projected to bring back seventeen starters from this year’s team including quarterback Jarrett Stidham, running backs Kamryn Pettway and Kerryon Johnson, all four defensive line starters and cornerback Carlton Davis. They are 5-2, but their +19 in net points per game and +140 in yards per game suggest that their performance is closer to 7-0 than 3-4. Oklahoma State wide receiver James Washington isn’t just putting together a fantastic season, but he very well could go down as one of the most explosive playmakers in college football history by the time his season is over. At his 2017 pace, Washington will skyrocket up the college football record boards in all receiving categories. He’s already ascended into the Top 30 in yards and yard per reception and Top 50 in touchdowns, but it’s truly remarkable of where he could stand when the dust settles when you focus solely on Power Five conference teams. He’s on pace to become the all-time leader in receiving yards as well as finishing in the Top 10 in both yards per catch and touchdown receptions. But often times, the players thought to be the greats the receiver position don’t last four years in college, choosing instead to leave early for the NFL. To compare Washington to the recent greats at the position, I’ve taken the career numbers for each of the Biletnikoff Award winners since the trophy’s inception in 1994. Only four of the 21 winners played all four years in college, but even within that context, Washington’s projected numbers remain incredible. 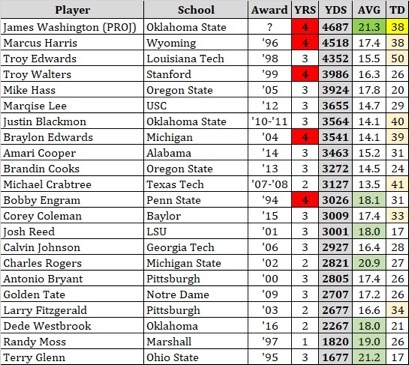 Fitzgerald and Rogers remain the two best wide receivers I’ve seen in college during my lifetime, but Washington is unique in that no player has been able to accumulate as many yards as he has while maintaining the same level of per play explosiveness. Washington State quarterback Luke Falk is one of many college signal-callers who fall victim to the same “plays in a spread offense, can’t read the field, doesn’t take snaps under center” evaluation from armchair draftniks. I admittedly have been a fan of Falk. Not a “should go in the first round” fan of Falk, but a fan nonetheless. But the negatives that arise on most scouting reports about Falk reared their ugly heads in Washington State’s disappointing loss to California. He held the ball too long and the Golden Bears brought constant pressure leading to sack after sack, nine in total. He forced the ball into tight windows and double coverage, and he stared down his receivers, leading to five interceptions. The only passes he completed consistently were the same dump offs, screens and short crossers that scouts know he can handle. I’ll never use one game as a reason to fully come off of a prospect. Falk still has the size and experience that will intrigue some teams. But Friday night’s tilt against a usually generous Cal defense was disconcerting. Round of applause and a big thank you to Minnesota quarterback Demry Croft and wide receiver Tyler Johnson for connecting on three touchdowns and covering that four-point spread in the waning moments. If you’re in to that sort of thing. I’ve been doing draft rankings since 2002 and Barkley is going to be #1 or #2 behind Adrian Peterson when all is said and done. But this isn’t a race predicated on pro projections and winning the award as a running back means you can’t have any big duds. Barkley is about to run into a gauntlet of teams that a) know he’s coming and b) are adept at shutting down the run. Penn State is about to face Michigan at home followed by road trips to Columbus and East Lansing. All three opponents allow less than three yards per carry on the ground and give up less than 110 rushing yards per game. And as good as Barkley has been catching the ball out of the backfield, all three teams will be ready for that as well. If he stays healthy, as is the qualifier I use for any running back (or football player for that matter) when projecting out their future potential, Barkley will be a superstar at the next level. But Heismans aren’t given out for future potential. And as difficult as he is to game plan against, there’s a chance Barkley’s time as a Heisman front-runner may be over when these next three weeks are over. The running back I believe will not go away in the race as long as he keeps putting up astronomical numbers is Bryce Love. Everyone is trying to come up with their own amazing Love statistic now, but this one is pretty remarkable. Via the College Football Reference Season Finder tool, there have been 46 players since 2000 to have at least 1,000 yards rushing through their team’s seventh game. Of those players, Bryce Love has rushed for the most yards and his yards per carry is almost a full yard better than the next player (10.3 to 9.5 by Melvin Gordon). In last year’s Pylon U Season Preview episode, Shane Alexander and I talked about Bryce Love as a scary complement to Christian McCaffrey. It turns out he’s just as scary as the main attraction. One other player mentioned above that I believe warrants further discussion is Alabama’s Minkah Fitzpatrick. There will come a day when there is a defensive Heisman or there is simply more attention given to the already existing award for Defensive Player of the Year, the Bednarik Award. The most outstanding player in the country isn’t always an offensive player. Granted, the importance of the quarterback position plays a huge role in who receives the award. But still, there have been instances – Oklahoma’s Roy Williams in 2001 and Nebraska’s Ndamukong Suh in 2009 come to mind – where a defensive player’s season-long performance resonated more with me than the actual winners. The real problem is that so much of what goes into the Heisman voting process are raw numbers and not a clear focus on what is actually happening in the game. Offensive yards and touchdowns are easily quantifiable and understandable because they are easy to measure against others at the same positions and also allow those that don’t watch all of the games (which admittedly is difficult) to get a small taste of what happened. Alabama just keeps on rolling and I don’t see that train coming close to a stop until the Iron Bowl, at least. More than likely, they ease into the playoff, even with one loss. Penn State is at #2 now, but as I mentioned when talking about Barkley, these next three weeks are going to be rough and even if they make it through that stretch unscathed, Wisconsin in the Big Ten Championship is no pushover. Georgia’s path, like Alabama’s, has Auburn as the only major road block, if you consider the Tigers major at this point. I think if Georgia wins out, they get in even with a loss in the SEC Championship. And it would be deserved. TCU has been an incredible story, but unless they are able to head to Norman and beat Oklahoma on the road, while finishing the season undefeated, it’s highly unlikely they would be a one-loss candidate. Many people wrote Ohio State off at the beginning of the year following their early loss to Oklahoma, but as I mentioned earlier in the season, a similar thing happened in 2014 when they lost to Virginia Tech, a weaker team than the Oklahoma squad that defeated them this season. And lastly, I remain very hopeful that the November 4th matchup between Oklahoma and Oklahoma State will carry significant meaning, not only for playoff consideration, but in the Heisman race. With both teams carrying a conference loss, it’s highly unlikely they will meet as some projected, in the Big XII Title Game. But I still believe both of these teams present a bigger threat on the national level than TCU. If Oklahoma wins and follows it up the next week with a win against the Horned Frogs, they would probably be looking at a rematch with TCU in the conference title game. If the Cowboys win, they would probably get a chance to avenge their earlier loss to TCU. Follow Jeff on Twitter @jfey5 and find his other work here, including a comparison of modern Super Bowl teams, the best playoff QBs in recent memory, and his predictions for the 2017 Heisman Trophy race. Jeff Feyerer is currently a school district CFO living just outside Chicago. Jeff's football experience includes draft and college football work for Ourlads.com, various coaching stints including Loyola University, marketing with the Houston Texans, and numerous writing projects dating back to his time at the University of Illinois. His football research interests include team building, asset diversification, the intersection of analytics and scouting, and the lost art of inside linebacker evaluation. Jeff has a Master's from Northern Illinois and divides his non-football/non-work time between his wife, son and his other sport, basketball.